The history of East Trenton is truly fascinating. Some of the most important goods in the country, such as rubber and ceramics, were produced in East Trenton. Rubber from Trenton was used to make military boot soles and Lenox Ceramics was fit for presidents during the early 1900s. ​While the rise and fall of industry in East Trenton is common to many other American cities, East Trenton's history is unique. This page consists of a number of resources to help share and visualize its history. We hope you find it informative. Let us know what you think! Click here or scroll down to see more! Like much of the Trenton area, East Trenton was largely undeveloped land inhabited by the Unami (Lenape) Tribe of Native Americans before White settlers arrived. By the mid-1700s, a famous physician named Thomas Cadwalader had come to own much of the land that is now East Trenton, though he did not develop it. Samuel Henry, a wealthy businessman, purchased from Cadwalader land near what is today the intersection of North Clinton Avenue and Nottingham Way and became the first to develop the area by building a grist mill and planting an orchard. Henry sold his estate to General Philemon Dickinson, and by the late 1790s the area hosted a blacksmith shop, several mills, houses and barns, and a large orchard. In 1792, Dickinson’s son Samuel built "The Grove,” which later became the East Trenton Library. Samuel Dickinson’s son, John Dickinson, unsuccessfully planted mulberry trees on what is now Mulberry Street in the hopes of cultivating silkworms for trade. While the silk industry in East Trenton never took off, other industries soon arrived. In the late 1830s, construction of the Delaware & Raritan (D&R) Canal and Pennsylvania Railroad, both of which ran through East Trenton, set the stage for industrial growth in the neighborhood during the 1850s and 1860s. During that time, a number of porcelain, rubber, and other businesses emerged. Companies such as Lenox Co., Star Porcelain Co., Murray Rubber, and Taylor Provisions (known as Taylor Ham) built factories in the area. The porcelain factories were primarily in the northwest side of the neighborhood along the D&R Canal, and the Rubber Companies were primarily along the Assunpink Creek. Taylor Ham remains in its original location on Perrine Avenue. As more companies set up shop in East Trenton, they attracted more residents to what had been a largely undeveloped area. In the 1850s, large estates began to be subdivided into building lots laid out along newly created residential streets close to the creek. Since the area along the Assunpink was largely swampy wetlands, developers of both homes and factories added mounds of soil or fill to raise the land and make it safe for construction. However, the fill consisted of mostly coal ash, which contributed to contamination in the neighborhood today (see aerial map for locations of fill). By the 1880s, East Trenton was a thriving community with over 100 businesses and an increasing residential population. In the 1920s, Trenton’s economy started to decline. Over the course of 30 years, companies merged and factories closed. This happened just as more African American families arrived in Trenton from the South, many of whom settled in East Trenton. The concentration of immigrant and African American households led to the neighborhood being “redlined” in the late 1930s. Redlining was a racist policy carried out by the Federal government and banking institutions under which home purchase loans were denied to residents of redlined neighborhoods – these residents were often African American. White residents had more of an opportunity to leave for the suburbs, while racist exclusionary rules prevented African American families from joining them. This subsequently led to further economic decline due to segregation, disinvestment, and insufficient wealth-building opportunities. In the 1950s, misguided plans for “urban renewal” designed to expand the Downtown resulted in the demolition of the Coalport section of East Trenton and displaced hundreds of residents. In the next decade, rioting in Downtown after the assassination of Dr. Martin Luther King Jr. negatively affected the perception of the city as a whole and of East Trenton. 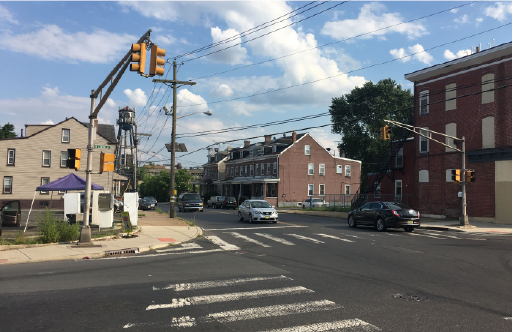 Since then, despite the presence of a strong community, East Trenton has struggled to bring about economic improvement and neighborhood revitalization. The East Trenton Collaborative is working for positive change and welcomes your thoughts about the history of the neighborhood. We will expand on this with a focus on more recent history over the coming months. These "Then and Now" Slider show what East Trenton used to look like and what it looks like today.